What a great idea. I obviously haven't been looking at design sponge enough lately. :) Your version is lovely! All red buttons makes it really nice. wow, yours is so great. It drew my eye immediately when it was in my flickr contacts lineup. Lovely! What I really dig are the buttons. You must have a prodigious button collection indeed to have been able to gather such a varied group of embossed red buttonsfor this. it really makes it! This is so beautiful, i go and make one immediatly ! 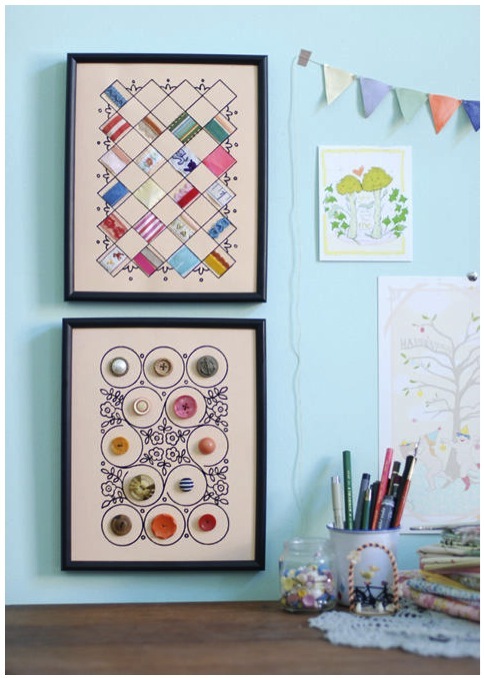 My vintage buttons would love to be displayed so elegantly! 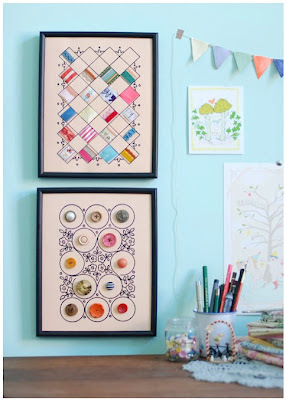 I must find my inner-embroiderer so I can complete this pretty task. This is an AWESOME project! I thought I had recognized it from D*S! Oh wow! It's really lovely, what a great idea. I love yours version best with just the red buttons. Gorgeous! it's beautiful :) i love both versions! Beautiful idea! Can't wait to get to work on it! I'd love to try this. You chose beautiful buttons!! This is genius! Thanks for sharing your pattern! I love this idea! I can't wait to try it! Now to plunder though my buttons, floss and fabric and come up with the best combination! Thanks! Thanks for the inspiration. I've been looking for my next embroidery project, and I think I've found it! ooo, thank you so much! I love it and love it that you have shared the pattern. Using the beads is brilliant - adding a little extra sparkle is always good! Perfect! I have just found the perfect gift for my 'swap' partner. I think I may use little circles of fabric instead of the buttons. I will post a picture when it is finished. Thank you. I love this. And thank you for sharing the pattern! i love this! it seems hard to believe that you haven't mastered the french knot---I can make a french knot, but can't seem to make evenly sized stitches. This is so cute! Over the holidays I toyed with an "homage to the pearly kings" wreath doing something similar with mother of pearl buttons on black felt. I never got to it, but your pretty work is re-inspiring me! what a great idea and it looks so pretty too - will have to share the love! Thank you so much for the inspiration! I loved this design on design*sponge, but your redesign is divine! Please check out my newish blog, where I wrote an entire post about stitching it up! My mom struggles a lot to with the french knot. I struggle to make any kind of knots so I feel for people that aren't the best at this art. Hi I'm writing a blog post about my blackwork inspiration. Is it ok to add a link to your post? I love the combination of stitch and buttons.